And before i get another warning - Im not being negative. Its a smart business technique. So gg VR. Either that or people will get into end game much later due to shortage of lixes if whales stopped buying plat ( many of them alrdy stopped as they wait for unity progression ). Some might even quit because it gets really tedious and repetitive to lix at tower. 180-220 killing mostly the same mobs over and over again is really torturous. It’s different from grinding at boggans/trolls/bolgs bcuz those levels pass by quite fast. Maybe we can still get to 190 using blossoms but I’m just saying. Maybe we can revert the “nerf” and make blossoms spawn less frequent. Or scatter them across the wide area so people have to engage with the mobs along the way. Or have them drop from creepers. 1-2 blossoms depending on difficulty of the creeper. If you think we are getting levels too easily there are many ways to make it harder and not just “fix” the numbers. VR adds more memes than all of us combined. The numbers are in. Blossoms have slowed down the money, but is it all from blossoms? Or does it matter? Blossoms slowed the need for lixes on a server. Non-plat buyers had to buy theirs from plat buyers, and plat buyers still needed their own supplies. Less people spending cash overall. This was an easy fix to adjust those rates to get some cash flow back. 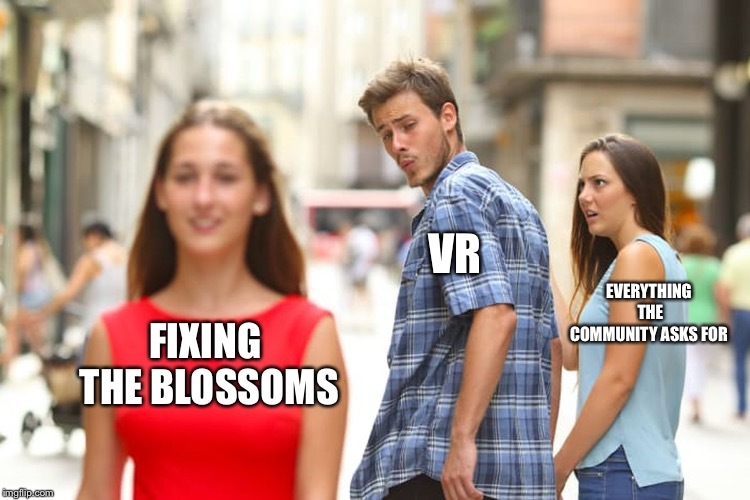 However, I don’t want VR to think that blossoms were the root of the issue. I don’t think they are that naive, but just in case; see below. Just a reminder that my money didn’t stop from blossoms. It stopped because the drop rates are broken. The cyclical problem boils down to drop rates, and the need for content to be monopolized by dom clans because of the horrendous drop rates. It’s almost 2019, and the same clans killing BT regularly still need Mordris helms. Ever heard of EverQuest? Ever heard of World of Warcraft? Lucerin wrote: The numbers are in. Blossoms have slowed down the money, but is it all from blossoms? Or does it matter? Careful before you get a warning too. Lol but in seriousness. I agree with all this. Have you ever played them? It doesn’t sound like it. Any idea how long it took to get your full raid in tier 2? Want to know how much loot we just trashed because we got our 19th Rogue chest and only 1 Mage in that time? Want to guess how many months it took for a Neltharions Tear to drop for our guild (my buddy’s guild got one on his first kill, I was pissed, Swee I can relate.)? Let’s not even get into tier 3 which even if you could complete the raid,which most couldn’t, barely anyone killed it enough to get a full set, how about Atiesh? ...and Everquest has even more scarcity. Now sure you could argue WoW has moved on, but that’s not the game we want to make...and it’s not the game you want to play or you’d be playing any one of the dumbed down auto running, auto questing options out there instead. On the reasoning for the change, the quest was broken, it was obviously broken, we let it go for a while to give you folks a break but it was never going to be allowed to stay like that forever. So ch is suppose to be everquest like. From this statement you said. Assuming like tier 1 is dl. Tier 2 edl. And tier 3 lets say dg. Sets are still scarced but slowly bein made after YEARS of farming the same 2 bosses and 1 boss that sometimes goes weeks without dropping a pure. I started EQ in ‘99. I care little about the blossoms. I just didn’t want any accidental causal data being used for the lack of cash flow.